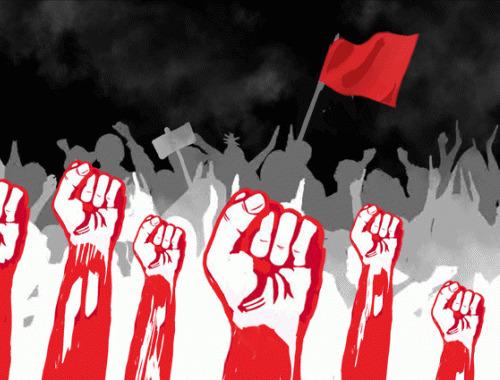 On the 8-9th of January, 150 million workers went on strike in India. The strike was organized by ten different trade unions, covering transport, banks, financial services, state-owned, power, steel, car and other factory workers. It follows the protests by farm workers, who are joining in the action. 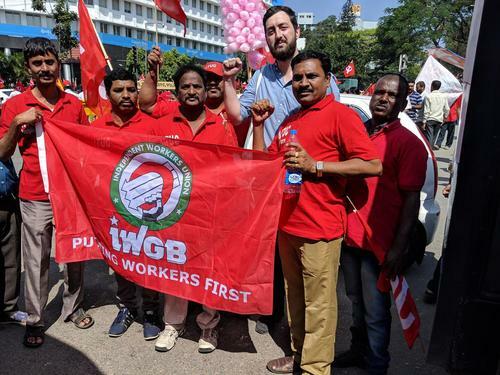 Jamie Woodcock was in Bangalore and attended the demonstration on the first day of the strike. In Bangalore the strike was strong, shutting down transportation across the city. On the 8th of January, the unions called for a demonstration outside the town hall. There was the visible presence of transport workers (mainly bus drivers), factory workers (particularly aerospace), and bank workers, who joined a lively picket from across the road. While the weather reached around 30 celsius, the demo grew more and more packed. Police officers in tan uniforms, equipped with helmets and large batons, kept their distance at the edge of the demo. Most of the flags on the demonstration were red, many with hammers and sickles. In Bangalore, the most prominent were the All India Trade Union Congress (AITUC) and All India United Trade Union Centre (AIUTUC). 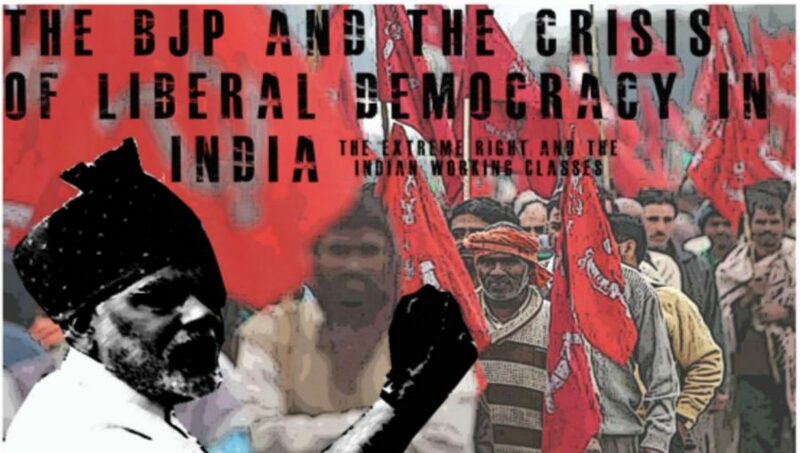 The AITUC is the oldest union federation in India and associated with the Communist Party of India (CPI), with a registered membership of almost 2.7 million. 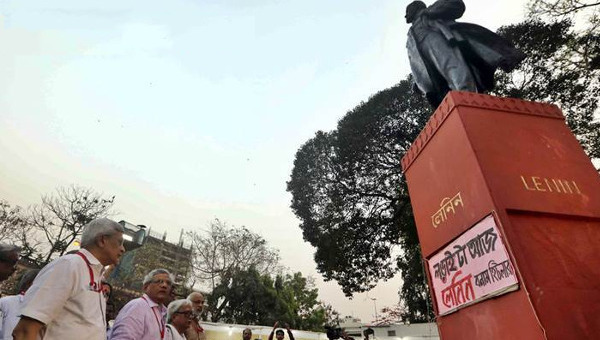 The AIUTUC is the trade union wing of the Socialist Unity Centre of India (Communist), with a claimed membership of over 2 million. In addition to this, there were a range of other communist affiliated unions, including AICCTU, TUCC, CITU, and so on. To an outside observer, the differences between their different red flags with hammers and sickles could be a little hard to discern. What was clear was that this strike was mobilizing large numbers of workers. Stop all pro-corporate, anti-worker amendments to Labour laws. Against the privatization and corporatization of Transport system proposed in the Motor Vehicles (Amendment) Bill, 2017. Implement a national common minimum wage of Rs.18,000 per month for all workers. Institute universal Public Distribution System to contain inflation and price-rise. For the legislation of compulsory recognition of unions and mandatory registration of trade unions within 45 days and for the ratification of ILO conventions 87 and 98 (for freedom of association and right to collective bargaining) in the Parliament. Abolish contract labour system. Implement the principle of equal pay for equal work and regularize contract and all non-permanent forms of employment. Stop the disinvestment of Public Sector Units and disallow Foreign Direct Investment (FDI) in Banking, Insurance, Defense sectors. Regularise the employment of scheme workers as Government employees as per the recommendations of the 43rd Indian Labour Conference. For the institution of social security fund for the unorganized workforce with sufficient budgetary allocation and provide Provident Fund coverage for all unorganized workers. In the context of job losses due to demonetization and economic crisis, implement urgent measures to generate stable employment and regularize the NEEM, NETAP and FTE forms of employment through amendments. Increase the eligibility limit and maximum limits for Payment of Annual Bonus, Gratuity, Provident Fund and ESI. Stop the investment of Provident fund and Pension funds in the stock markets. Stop the diversion of ESI funds to the Reliance group. As the demonstration set off across the city toward freedom park, a large section of the Indian National Trade Union Congress (INTUC) joined. This is affiliated to the Indian National Congress party – previously Ghandi’s party that is currently in opposition. Their flags stood out, given that they featured neither red or communist iconography. However, given the anti-Modi mood on the demonstration, their members looked keen to participate. The demo itself was led by an auto rickshaw (a common sight in Bangalore), converted with loudspeakers to lead the chanting. The only part I recognized was one that the crowd replied “Zindabad!” (or “long live!”), which might have been the second part of “Inquilab Zindabad!” (or “long live the revolution!”). This was followed by a open top truck with even more speakers, draped with flags from each of the unions. I marched with my union, the Independent Workers union of Great Britain (IWGB), flag which meant I was approached by lots of workers, wanting to know which union it was. Many of the workers were keen to talk about struggles in India and the UK – as well as some who just wanted to take selfies. The public sector workers I spoke to wanted to know how privatization was being carried out in the UK – as well as whether there had been successful campaigns against it. There were a small number of tech workers who had come out in support of the strike. They were keen to make contact with tech workers in other countries as Bangalore has a large tech and outsourcing sector (with a purpose-built “electronic city” in the southeast), and there have been limited attempts to organize so far. 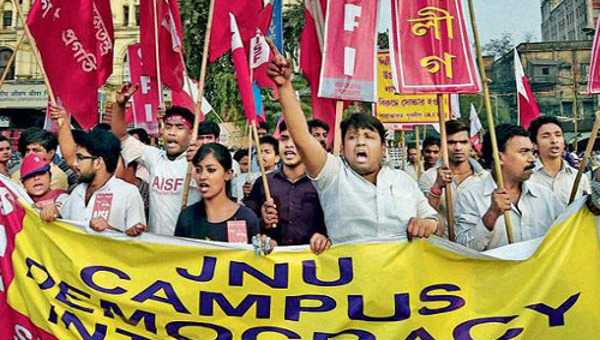 I spoke with activists from the CPI (ML) Liberation – a Maoist, mass movement-orientated faction – that had a prominent presence at the demonstration. After moving away from guerilla activities, they have been involved in organizing groups of previously unorganized workers like street vendors, as well as supporting landless farmers struggles. 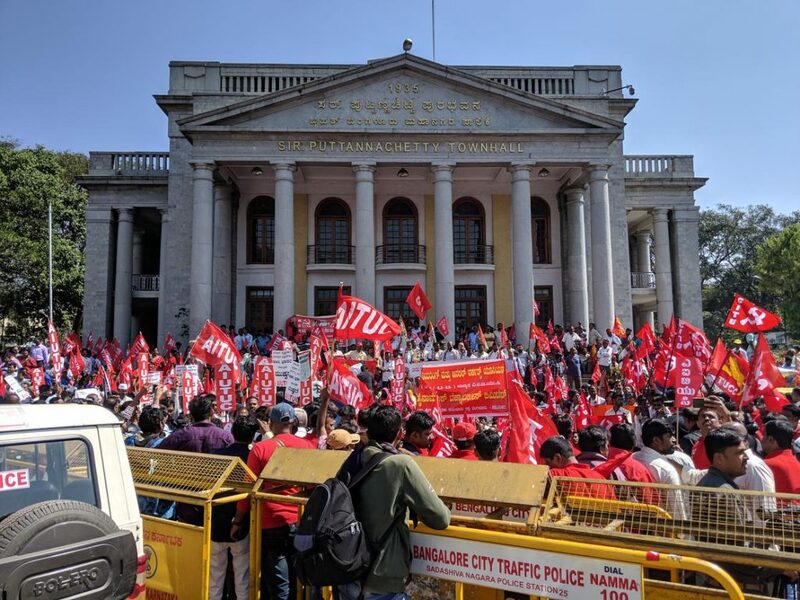 One of their organizers had been out in the regions around Bangalore before coming to the strike, reporting that it had been successful so far. One of the victories saw workers successfully shutting down a sanitation plant by holding a strong picket. Once the demo reached freedom park, its scale and composition became much clearer. The majority of the workers were aligned with the “red” unions, and political parties were playing an important role. The crowd of workers was diverse, with a large number of women, as well as significant numbers of visible Muslims. As the demonstration stopped, the crowd broke into its different sections to watch the speeches from the back of the open top truck. Chai sellers moved through the crowd and smaller impromptu debates started happening away from the speakers. Just around the corner the riot police drank chai too, some under the shadow of another converted truck – this one equipped with the large water cannon at the ready. Dr Jamie Woodcock is a researcher at the Oxford Internet Institute, University of Oxford. He is the author of Working The Phones , a study of a call centre in the UK inspired by the workers' inquiry. His current research involves developing co-research projects with workers in the so-called gig economy. He is on the editorial board of Notes from Below and Historical Materialism . Follow his tweets at @jamie_woodcock.